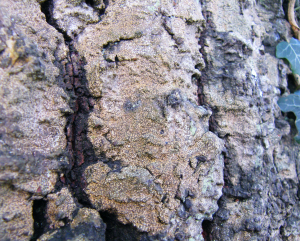 Observation - Unidentified lichen on oak bark - UK and Ireland. Description: Probably crustose, but looks a little leafy in some of the expanded shots. Any suggestions appreciated as I have not been able to make any progress identifying this one. Probably crustose, but looks a little leafy in some of the expanded shots. Any suggestions appreciated as I have not been able to make any progress identifying this one.